One of my very favorite appetizers to order at a restaurant is Potato Skins. I love the fact that they are considered a finger food. This is the one time that it is socially acceptable to pick up a potato and eat it with your hands. 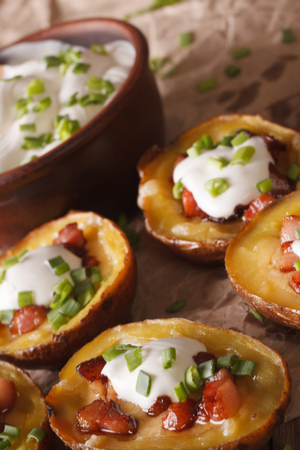 Potato skins filled with cheese and bacon and topped with green onions and sour cream. Plus who can resist the taste of cheese and bacon on a crispy potato skin? But almost every time I prepare appetizers for a party, I rarely think about making potato skins. Instead, there are plenty of dips and spreads, such as buffalo chicken and spinach artichoke dip, on the counter. And don’t forget the ever popular chicken wings that are a must have for a game day party. Because I make most of my appetizers in my Instant Pot, slow cooker or in the air fryer, my oven rarely gets used. 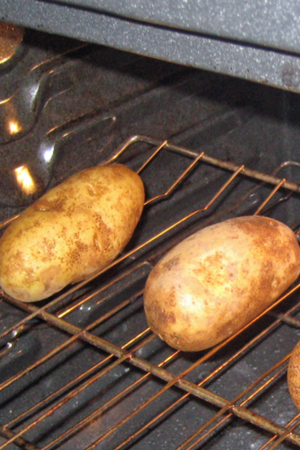 Bake your potatoes right on the rack of your oven for best results. Which means that I have no excuse not to make potato skins! The first thing that has to be done is to bake the potatoes. I know that there are several ways to bake a potato. And the oven isn’t necessarily the quickest method. 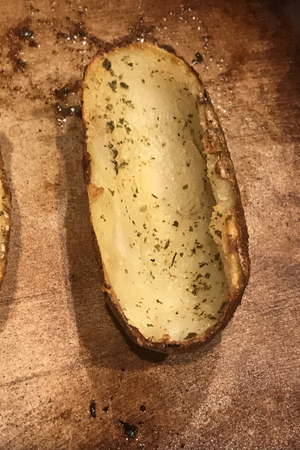 But although it is much faster to make baked potatoes in the microwave or Instant Pot, I wouldn’t recommend it for this recipe. The skins of the potatoes need to be firm and crisp. And it is difficult to achieve that in the microwave or pressure cooker. 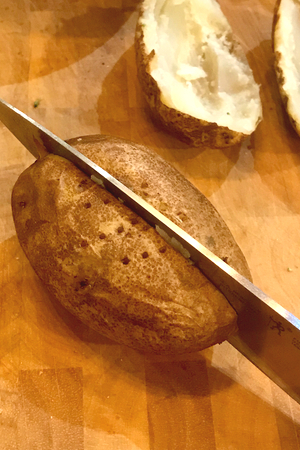 Once the potatoes are cool enough to handle, cut them in half. However, the oven does just that. And it is even better when you rub oil on the potatoes prior to baking. The oil penetrates the skin which allows them to become firm and crisp as they bake. Yes, it takes longer, but it is well worth the time involved. But we have also found a way around this time consuming task on party day. A week or two before the party, when we have plenty of time on our hands, we will bake several potatoes. 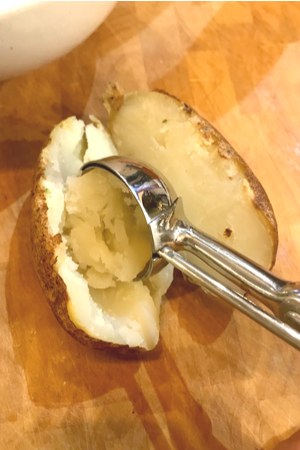 Scoop out most of the potato – this is easy when you use a cookie scoop. After they cool a bit, we will scoop out the insides (which we use for our twice baked potato or potato soup recipes) and freeze the skins. Then on the morning of the party, we pull them out of the freezer to thaw. All that is left to do is to add the toppings and bake them! In less than 20 minutes, the potato skins are ready to be served! When you are hosting a party, every minute that you can save is precious. 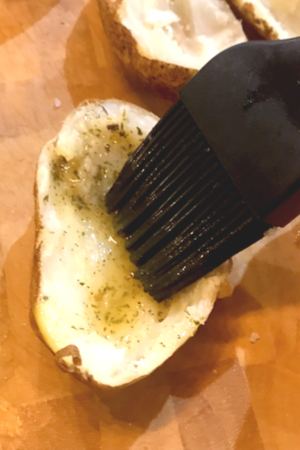 There are a few tips that we have learned over the years that will help you make perfect potato skins. We already discussed the best way to bake the potatoes. And be sure to add the oil to the outsides of the skins before baking. Leave about 1/4 inch of potato to support the toppings. Once the potatoes are out of the oven, be sure to wait until you are able to handle them before cutting them. You want to make sure that the insides are still tender and warm enough to scoop out easily. And speaking of removing the insides, we have found the perfect utensil for the job! A medium size cookie scoop works really well for this task! Brush the butter mixture all over the potato skins. 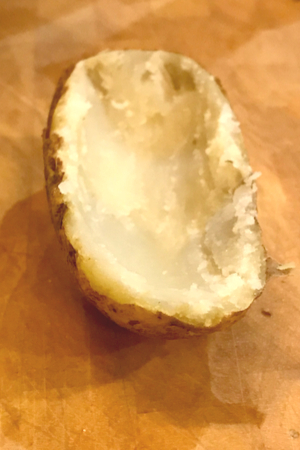 Not only is it easy to remove the potato innards, it is also just as easy to release it into a bowl. Save the discarded potatoes for other recipes. We use them to thicken potato soup and we also add them to the mixture when making mashed potatoes. Another key to making perfect potato skins is to add a little flavor to them. Potatoes are very bland and need to be seasoned well. We do this by not only adding a little salt to the potato. But we also coat the skins in a butter and Italian seasoning mixture prior to baking them. Place the hollowed out potato halves face down back in the oven. Why Italian seasoning? We find that the blend of spices found in dried Italian seasoning gives the potato a great flavor that isn’t masked by the cheese and bacon. It really does make a huge difference in the taste of the potato skins. And finally, be sure to bake your potato skins skin side down first. This not only allows the skin to be exposed to the oven and become crisp. It also allows the heat to be trapped in the cove of the hollowed out potato, making sure that it remains tender. Then turning them over to crisp up the potato edges is all that is left before it is time to add the toppings. Bake the potato skin until the edges turn brown and crispy. Quite honestly, you can add whatever toppings that you prefer. However, for this recipe, I stuck with the basics: cheese and bacon. And of course, with the option of adding green onions and sour cream when served. But I have also had some delicious variations of potato skins. One of my favorites was when barbecue sauce was spread on the potato before the cheese was added. It gave the potato a surprisingly unique flavor. 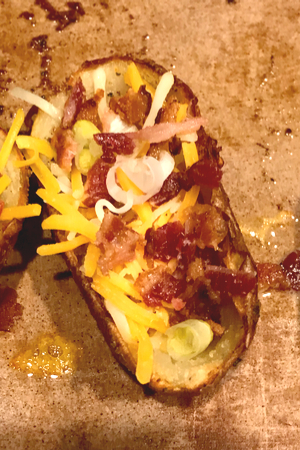 We actually have replicated that flavor in our Loaded Baked Potato Rounds Recipe. Sprinkle the cheese and bacon inside the potato skin. But I have also seen potato skins served with diced jalapenos, diced banana peppers, red onions and shredded pork. Whatever toppings that you prefer, I am sure that you will enjoy them! 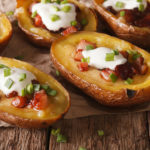 Baked potato skins filled with cheese and bacon and topped with green onions and sour cream for the perfect, easy to eat appetizer. Clean the potatoes and allow to dry. Rub the olive oil all over the potatoes. Place potatoes in the oven and bake for 30-40 minutes until skin is crisp and potatoes are tender. Remove from the oven and allow to cool until able to be handled. Cut potatoes in half lengthwise. Scoop out the insides, leaving about ¼ inch of the potato inside the skins. Add the Italian seasoning to the melted butter and mix well. Brush the butter mixture on both the outside and the inside of the potatoes. Sprinkle the inside lightly with salt. 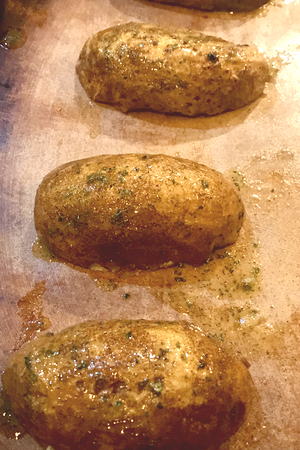 Place potato halves face-down on a baking sheet and bake for 5 minutes. Turn the potatoes over and continue to bake until the edges of the potatoes start to turn golden brown, approximately 5 minutes. Garnish with green onions and a dollop of sour cream if desired.